There are plenty of novel device chargers out there, but some of them stand out thanks to their originality. 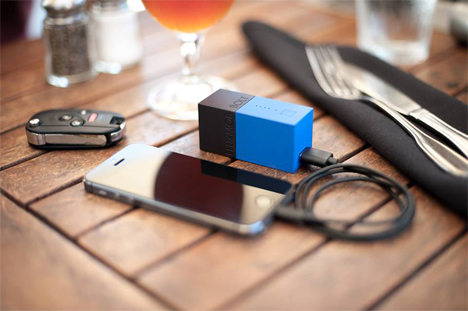 The BOLT is a portable USB charger that also acts as a back-up battery for any USB-charged device. Built-in fold-out power prongs make it easy to carry around – as long as you don’t mind carrying around a somewhat bulky thing with lots of corners. BOLT eliminates the need to carry both a wall charger and an extra back-up battery for your devices. Designed by FLUXMOB, the BOLT contains a 3000mAh Li-Ion battery that charges up as it charges your device. When you’re ready to hit the road, unplug the BOLT and take it with you as a back-up battery. 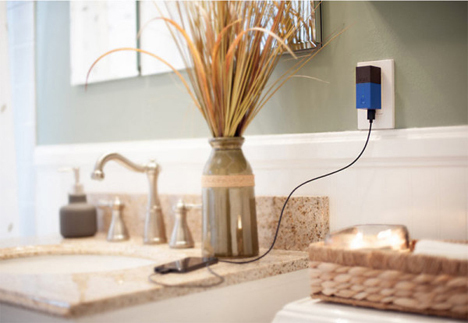 The designers say that BOLT is the world’s smallest combination wall charger/backup battery. A set of indicator lights on the device let you know how much juice it’s storing. Although it depends on what type of device you’re charging, BOLT can take the battery from totally dead to fully charged in a couple of hours. An iPhone 5s can be fully charged in less than two hours and the BOLT can provide 1.5 charges when it’s carrying a full charge itself. See more in Phones & Mobile or under Gadgets. April, 2014.